University Press of New England, 9780874517385, 212pp. Roxana Robinson's great gift for the telling detail and strong sense of the emotional shoals lurking just beneath even the calmest surface have inspired comparisons to literary greats like John Cheever, Henry James, and Edith Wharton. In her first novel, we meet Laura, a 29-year-old wife, mother, sister, friend, lover, and erstwhile photographer whose life is painfully out of focus. 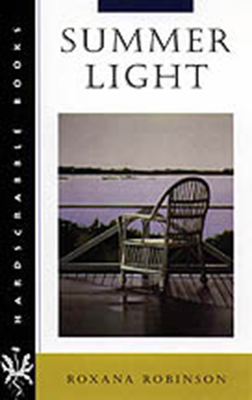 A month's vacation on the Maine coast with her son, her lover, Ward, and her sister's family is supposed to be an idyllic period of sustenance and calm, but for Laura, who believes that "entropy governed the world, the universe, and the dinner hour," it turns into the ultimate test of her ability to trust herself and others. With trademark intensity and a deft touch for character and place, Robinson creates a perceptive, believable, and gently humorous portrait of an individual "waiting for something that would set her life in order." Laura is as much a study of light and shadow as the photographs she takes. Beautiful but insecure, talented but unwilling to take risks, loved but unable to make a commitment, she is paralyzed by fear and locked into a stasis that Ward is no longer willing to accept. "You don't dare take a stand on anything," he tells her. “You're so terrified of failure you don't dare do anything.” When her estranged husband arrives for a weekend visit, however, the emotional collision rocks Laura's inaction, causing a tiny shake of the kaleidoscope that creates a vastly different pattern. The image is razor sharp at last: "As though she were changing lenses, as though she had suddenly discovered another light source," she sees that her life is her own. That new understanding empowers her to make a symbolic -- and a literal -- leap of faith that saves her own life and the lives of those she loves.